For more than 150 years a well seated mushroom anchor has been the standard permanent mooring in the harbors of New England and Long Island Sound. The bottom in this part of the world is apt to be a combination of mud and sand with varying amounts of rock and clay. Most Harbormasters in this area specify mushrooms for permanent moorings. The long established “a mushroom anchor will hold 10 times it’s weight” is a rule of thumb when considering a pull test on a mushroom. Mushroom anchors seat readily in the soft sand all over the world but must be jetted in many areas where the sand is so hard that the mushroom bounces along the surface of the bottom. We advise consulting with your local Harbormaster for recommendations on dealing with your particular area. The proper seating of a mushroom anchor is as follows: Drop anchor in desired location with scope (line length) equal to 3 times water depth at high tide, circle 3 times in a motor boat (powerful enough to twist anchor into sand) with the line tight. Anchor bell will twist into mud and sand to assure proper seating. 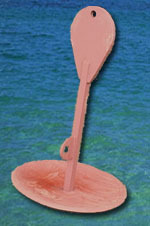 The anchor will develop full holding power after approximately 2 weeks of use.